As far as 'Classic Disney,' Beauty and the Beast pretty much has it all. Y'know, for kids (of all ages). 84 min. Walt Disney Studios Distribution. Directors: Kirk Wise, Gary Trousdale. Cast: Angela Lansbury, Frank Welker, Paige O'Hara, Robby Benson, Rex Everhart (II), David Ogden Stiers. 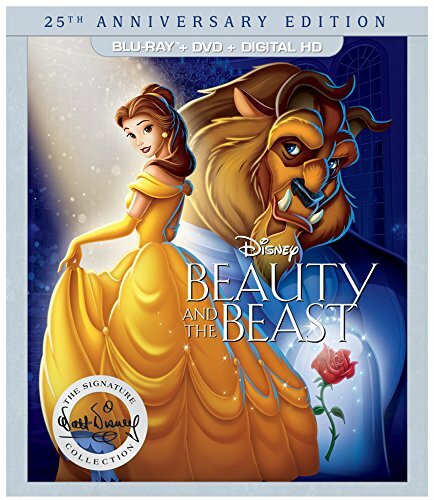 The pinnacle of the 1990s "Disney Renaissance," Beauty and the Beast famously became the first animated feature to score a Best Picture nomination. And if popular enthusiasm for the film has waned, it's probably only because the film has been lovingly watched and re-watched so many times. A case can made against the now-familiar Disney formula of cutesy anthropomorphization and a somewhat awkward attempt at a definitive retake on a classic fable. There is, too, in modern Disney films, an added layer of political correctness that some find progressive, others toxic, and still others wishy-washy (as ever, the resolving "reward" is outer beauty). In some ways, the curmudgeons have won, as the Disney tradition has morphed into the current age of Pixar, with its winning abandonment of formula in favor of a more sophisticated (but still politically correct) storytelling style. But as far as "Classic Disney," Beauty and the Beast pretty much has it all. Y'know, for kids (of all ages). The Disney Renaissance was all about the standard set by songwriters Howard Ashman (lyricist) and Alan Menken (composer), who had taken Broadway by storm with Little Shop of Horrors. 1989's The Little Mermaid had sparked a new enthusiasm for the potential of Disney, which had largely languished in mediocrity since the 1966 death of Uncle Walt. Ashman and Menken brought their show-tune sensibility to animated features, with lush ballads, limber comical numbers, and big, memorable, zesty showstoppers. Beauty and the Beast kicks off with "Belle," a narratively and musically brilliant introduction to the film's 18th-century French-village setting and its odd-girl-out heroine Belle (voiced by broadway chanteuse Paige O'Hara). Ashman understood the power of a heroine's monomythical musical announcement of yearning for adventure, patterned on The Wizard of Oz's "Over the Rainbow" ("Belle" also finds visual touchstones in The Sound of Music and Gone with the Wind). Disney's embrace of the "princess myth" loosens up a bit with Belle; her bookish precocity puts off her "provincial" neighbors, who can't understand her or her eccentric inventor father (Rex Everhart). She's stalked by a predatory parody of the alpha-male, muscle-bound masculine hero, the preening, self-obsessed, anti-intellectual Gaston (Richard White), but Belle reserves her affections for fairy-tale princes, a trait that's not exactly progressive but nevertheless prepares her to participate in the fairy tale unfolding nearby. That would be the tale of The Beast (Robby Benson), a formerly handsome prince doomed to remain furry, clawed, and angry unless he a woman falls in love with him before all the petals drop from an enchanted rose left by a lesson-teaching sorceress in old-crone disguise. The Beast dwells in a palatial castle, surrounded by a likewise enchanted staff of formerly human servants: candlestick Lumière (Broadway crooner Jerry Orbach), clock Cogsworth (David Ogden Stiers), and teapot Mrs. Potts (the legendary Angela Lansbury) ever shadowed by boyish teacup Chip (Bradley Michael Pierce). Impressively condensing the musical-theater formula, Linda Woolverton's script and Ashman & Menken's score never loses sight of entertainment as it propels forward to the eighty-five-minute finish line. There's high drama in the high-stakes romance that develops—too fast for audience questions, wisely—between beauty and beast, and generous comedy in the witty lyrics of rousing barroom number "Gaston" and all-stops-pulled production number "Be Our Guest" (in which Orbach takes the lead). Lansbury handles the gentle, lilting, Oscar-winning title ballad, and it all builds to a Frankenstein-esque "torches and pitchforks" climax. Disney's next generation of animation talent (the heirs to the studio's Golden Age group of "Nine Old Men") work wonders in all areas: gorgeous backgrounds, eye-popping layouts and, most crucially, lively and sensitive characterizations. Though much was made, at the time, of the CGI-enhanced ballroom dance sequence (using software developed for Disney by Pixar), Beauty and the Beast harkens back to the incomparable wonder of the initial wave of hand-drawn Disney animation. This somewhat messy situation reflects both Disney's ever-tricky marketing strategy and the rapidly shifting sands of home video. Nevertheless, the Signature Collection release of Beauty and the Beast has plenty going for it, beginning with reference-quality A/V. The hi-def transfer is perfection, with accurate, beautifully saturated color and detail that doesn't miss a trick. It's a tight, bright image, backed by a definitive, lossless DTS-HD Master Audio 7.1 sound mix that delivers music and effects with potency and precision in recreating the theatrical experience. The Blu-ray again features two cuts of the film: the "Original Theatrical Edition" (1:24:54, HD) and "Special Extended Edition" (1:31:44, HD), the latter including the musical sequence "Human Again" added for the film's IMAX re-release. This release also includes the "Sing-Along Edition" of the theatrical cut, which is simply the theatrical cut with fancy subtitles on the songs. To entice those who already own the film, this 25th Anniversary Edition includes several new bonuses on the Blu-ray. "Always Belle" (11:32, HD) is an interview with actress Paige O'Hara about her career, playing Belle, working with Howard Ashman, and what the project has meant for and to her. In the most heavily promoted new extra, "Menken and Friends: 25 Years of Musical Inspiration" (19:06, HD), Robert Lopez and Kristen Anderson-Lopez (Frozen), Lin-Manuel Miranda (Moana and Hamilton), Stephen Schwartz (Enchanted), and Alan Menken (Beauty and the Beast) have a Beauty and the Beast singalong and chat about the movie. Next up is "#1074: Walt, Fairy Tales & Beauty and the Beast" (9:36, HD) is a compact but very interesting look at Walt Disney's personal journey—literal and figurative—to Europe and its traditional fairy tales. Specifically, we learn of Disney's various plans for Beauty and the Beast before its eventual development into the existing feature, years after his death. "The Recording Sessions" (3:48, HD) offers a tantalizing glimpse into the recording booth in videos taken for animation reference (and, lo, promotion/bonus features). The extras thin out a bit with "25 Fun Facts About Beauty and the Beast" (5:24, HD), in which two young Disney stars (Stuck in the Middle's Kayla Maisonet and Friends Whenever's Gus Kamp) take us through the titular trivia; "Beauty and the Beast Sneak Peek" (1:24, HD), a quick tease of the upcoming live-action Disney film; "Song Selection (Sing-Along Edition Only)", which is simply chapter access direct to the songs for your sing-along enjoyment; and "Classic Bonus Preview" (0:43, HD) pointing the way to the extras now available only digitally. Also included on the Blu-ray disc is the archival bonus of the Extended Edition audio commentary with producer Don Hahn and co-directors Kirk Wise and Gary Trousdale. Below find my archived review of the 2011 Blu-ray 3D + Blu-ray edition still available as a U.K. import. 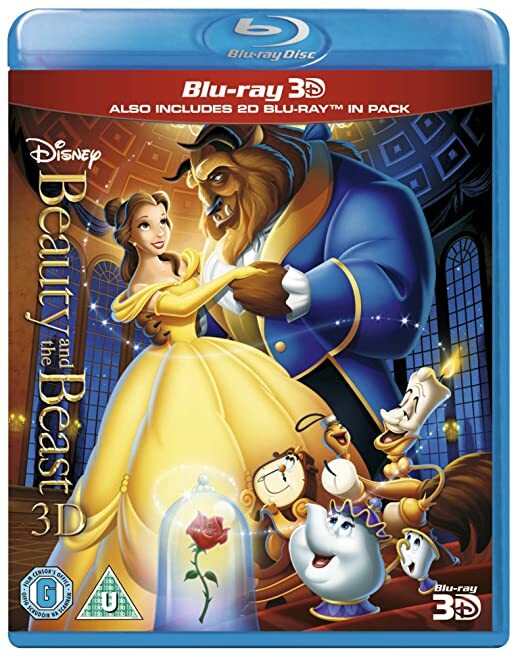 Disney does right by one of its beloved classics in its Diamond Edition Blu-ray 3D + Blu-ray + DVD combo pack and Blu-ray + DVD combo pack edition of Beauty and the Beast, available for a limited time before going back in the company vault. The 2D picture quality is unimpeachable, delicately transferring the original image to hi-def with visual snap and brilliant color, and the 3D presentation is downright stunning, with planes of characters, foreground objects, and backgrounds that naturally lend themselves to 3D conversion. In home-viewing 3D terms, the presentation is well nigh perfect, with only a couple of brief blips of crosstalk. And all things bright and beautiful in the 2D version retain their majesty in every bit of detail: this is reference quality 3D to impress your friends. The flawless picture comes wedded to a state-of-the-art DTS-HD Master Audio 7.1 surround mix that envelops the listener with every song, line of dialogue and soundscape of ambient effects, all put into perfect balance. This crisp Blu-ray presentation takes the cake, and it's well worth an upgrade for owners of the now relatively measly-looking DVD of years past. On Disc One (blu-ray), you'll find some terrific bonus features, including multiple viewing options for the feature. One can watch the film in either its Special Extended Edition (approx. 92 minutes) or Original Theatrical Edition (approx. 85 minutes). The extended version includes the musical sequence "Human Again" added for the film's IMAX re-release. Playback choices also include the Storyreel Picture-in-Picture Experience that pairs the theatrical edition with the filmmakers' original storyreel (basically a rough cut in a literally sketchy form derived from early animation or pre-production art) and a highly informative Extended Edition audio commentary with producer Don Hahn and co-directors Kirk Wise and Gary Trousdale. Lastly, one can watch the film in Disney Sing-Along Mode (a.k.a. subtitles for the songs). Next is “Composing A Classic: A Musical Conversation with Alan Menken, Don Hahn & Richard Kraft” (20:18, HD), which seats Menken at the piano (the better for him to break into a song); the candid conversation includes plenty of discussion about Menken's musical partner on the film, the late, great lyricist/writer Howard Ashman. A selection of Deleted Scenes includes "Alternate Story Open" (18:24, HD) with optional "Introduction to Alternate Story Open by Peter Schneider" (0:32, HD), and "Belle In the Library" (8:27, HD), with optional "Introduction to Deleted Scene by Roger Allers (0:36, HD). “Broadway Beginnings” (13:07, HD) rounds up familiar faces Jamie-Lyn Sigler, Nick Jonas, Donny Osmond, and Deborah Gibson to chat about appearing in the Broadway musical version of Beauty and the Beast. Also on hand is the “'Beauty and the Beast' Music Video Performed by Jordin Sparks” (3:26, HD). Disc Two (also blu-ray) serves up plenty more extras. The BD-Live-accessible game Bonjour, Who Is This? and Enchanted Musical Challenge: A Disney Quest Game will keep kids busy for a while, but the filmically curious should proceed to the "interactive documentary" “Beyond Beauty: The Untold Stories Behind the Making of Beauty and the Beast” (HD), which serves up over an hour and a half of branching pods covering a wide variety of topics by way of interviews illustrated with art and clips. Also archived on Disc two are the extensive “Classic DVD Features." These include the Celene Dion-hosted making-of doc “The Story Behind the Story” (25:41, SD), “'Beauty and the Beast' Music Video” (4:31, SD) performed by Celine Dion & Peabo Bryson, “Early Presentation Reel” (2:51, SD) with introduction by Hahn, “Alternate Version: Be Our Guest” (4:55, SD) with introduction by Hahn; “Alternate Score: The Transformation” (2:01, SD) with introduction by Menken, “Deleted Song” (6:58, SD) “Human Again”; an Animation section serving up “Animation Tests: Roughs & Cleanups” (4:54, SD), “The Transformation: Pencil Version” (5:24, SD), “The Transformation: Glen Keane” (3:13, SD), ballroom scene “Camera Move Test” (2:06, SD) with introduction by Hahn; and a suite of Trailers & TV Spots with “Introduction by Don Hahn” (0:35, SD), “Original Release Trailer” (1:57, SD), “Large Format Release Trailer” (2:35, SD), “TV Spot #1” (0:33, SD), “TV Spot #2” (0:33, SD), “TV Spot #3” (0:33, SD), and “TV Spot #4” (0:17, SD). All site content © 2000-2019 Peter Canavese. Page generated at 04/24/2019 07:19:03AM.